I recently picked up the Pimoroni Garden hat and some sensors to play with as it looked like a neat way of swapping breakout boards around without wiring or soldering. Soon after I thought why not upgrade my rover with the hat so it can drive around measuring air quality, temperature etc… Then I remembered I had my phat stack board lying around and the project turned into lets see how many hats I can stack on the rover. So first I added the phat stack with the breakout garden hat, explorer (motor) phat, four letter phat and a scroll phat HD. For convenience I also attached USB hub / Ethernet adapter. This makes it easier to work on the PI if there are any Wifi issues. The Micro:bit is a tiny computer designed by the BBC for educating children in computing. You may think there is not much point in using the Micro:bit for robotics when there is the Raspberry PI and Arduino available but there is beauty in its simplicity. Much like the Arduino you flash it with some code and it will run it until you flash it again. There are plenty of tutorials and different languages to use making it very quick and easy to work with. There are even block programming editors. Recently I got my hands on a second Micro:bit so I thought I would have a go at Bluetooth communication between them having one as a transmitter to control a robot powered by the other. The robot kit I have here is the Kitronik line follower buggy. It uses a motor driver edge connector board to drive the motor and monitor inputs. The board is nicely labeled so that you can see which pins you needs to write to in order to control the motors. I have just received the first 2 packs of an exciting new Star Wars part work build. This is a half scale R2-D2 which with both remote control and autonomous modes. It has a number of cool features including, a camera, sensors, face recognition and image projection. This subscription is currently in a test limited to areas of the UK. I finished building my robot today. It was a comparatively quick build compared to RC and model kits I am used to making. I will make a full post of the build and the technology behind it later but for now here is a video of me calibrating the servos that control the robots head. I needed to find the right values in order to make sure the robot looks where I want it to. The robot uses a Seeeduino which is an Arduino compatible controller board and has ultra sonic sensors for eyes. I have always had an interest in robotics but never really gone out of my way to find myself a kit to get started. I recently thought about trying to build some sort of quad copter with A.I. but it could prove costly if the thing kept falling out of the sky or flew away. Therefore I decided that a land robot would be preferable. 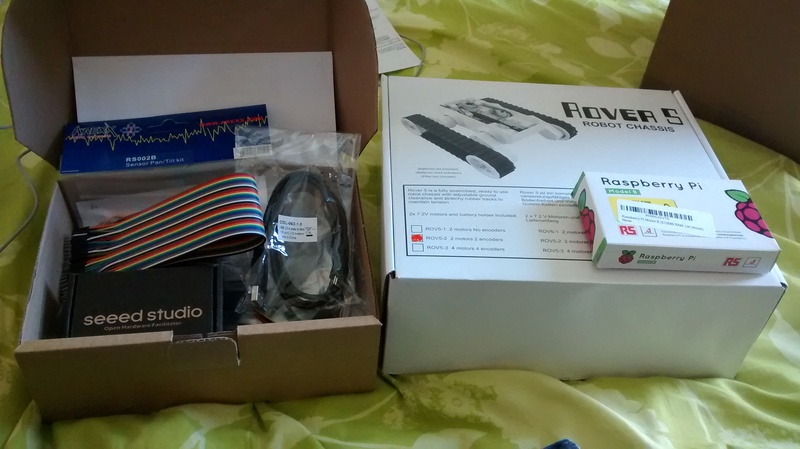 Here I have a kit I ordered from a robotics company I found in the back of a Linux magazine. It comes with a tracked chassis and all of the electronic components required to build and program a robot that will use ultra sonic sensors to scan its surroundings. Its exciting as I will be able to write the A.I. for the robot and improve on it to make it more intelligent. I also have the option of adding additional circuit boards to the robot to add functions such as light and sound. I will not be using the Raspberry Pi with it right away but I do have the option of integrating it in the future if I need to expand its functions.